We are 21CC Fireworks Ltd and we have worked with Dundas Castle since 2009, firing our spectacular firework displays and pyrotechnic effects as well as dressing the venue with our finishing touches including flambeaux, firepits, gas and candle lanterns and even snow! Our clients at Dundas Castle include wedding parties, private parties and corporate events. We are part of 21CC Group Ltd and based just 8 minutes from the Castle and our work takes us all over Scotland and to the rest of the UK. We are really proud of our customer service standards and we know this is something that Dundas Castle place a very high value upon. We thoroughly enjoy working with clients to create a fireworks display that will wow not only them but all of their guests. Throughout the planning we will work with you to ensure that your display is unique, any pyrotechnics you use are striking and the overall experience will be unforgettable! We are a creative, professional company, from initial enquiry to discreet set up and site clearance, our approach and procedures are tried, tested and guaranteed. This all means we are completely comfortable in working in such an exclusive venue, we know the layout of the land – literally – and understand what works well for our clients in terms of show size and design. We have a stock of well maintained smart dressing products that absolutely befit the surroundings that are Dundas Castle. Flaming Gas Flambeaux can flank the entranceway at the Castle and the Pavilion, pathways can be lined with our contemporary lanterns and our distinctive firepits can add a medieval touch. We have an excellent track record in customer service that is wholly contributable to our dedicated and longstanding team. There are eight of us in total, and two of our staff fully concentrate on our wedding clients alone, we can therefore ensure our enquiries are handled efficiently and our clients receive all the information and support they need. We are delighted to supply prospective clients with an event pack which includes a superb colour brochure describing our products and guideline prices, but also a full DVD showing our actual firework displays. This gives clients the opportunity to see what we can offer and what would work best with their vision. Every enquiry is unique, whether you are a seasoned event manager or perhaps you have never booked a firework display before, you will find we are approachable, professional, friendly and enthusiastic. Our role is to guide you, advise you and help you make the right decisions for your budget. We understand that your event is personable to you, and that budgets vary from event to event. We are able to offer different levels of show in terms of height and duration which can be flexed to suit your budget, which means we have something for everyone who hosts their event at Dundas Castle. We consider ourselves as being an extension of the Dundas Castle Team. 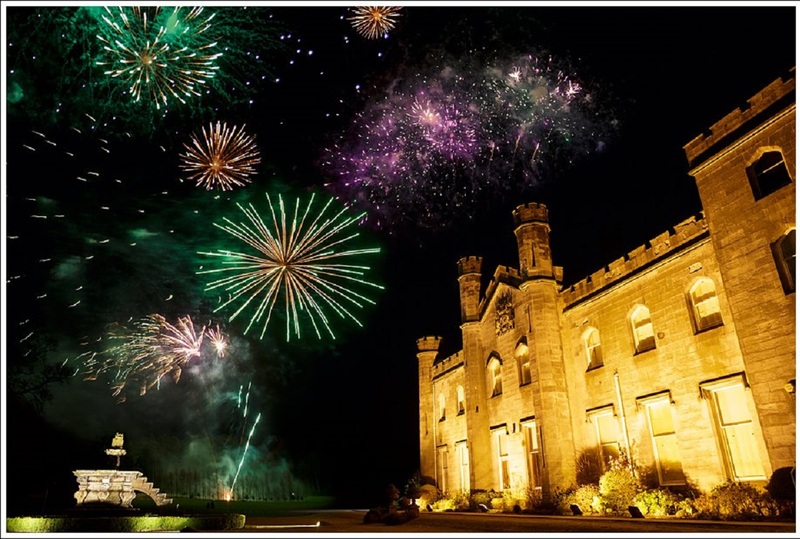 Our understanding of how events run at Dundas Castle, and of course their understanding of our set up and products means we have all bases covered in terms of designing and firing your fireworks show. We have designed and fired many shows over the past four years resulting in a trusting, solid working relationship that we all enjoy. The grounds at Dundas Castle are superb for our Fireworks Displays, with such an amazing vista from the Pavilion and the Castle itself, we love to design high calibre shows fired from multiple locations that give brilliant sky coverage that wow your guests. When you are considering a Fireworks show for your event, have a think about where you would see the show in terms of your event flow. Should it be a grand finale? Or perhaps it is to mark a special moment during your event? Is it a surprise for your guests? Also consider how long you think the duration should be, keeping in mind that a shorter more impactful show on a fixed budget will dazzle your guests far more than a stretched show over a longer period. These are all discussions we are more than happy to have with our clients. When our clients tell us that they want to create an event that everyone will remember it is an obvious suggestion for us to mention 21CC Fireworks. As a venue we have seen many of their displays but no two have ever been the same. We’ve seen heart shaped colourful explosions fill the sky, firepits and flambeaux create an authentic medieval theme outside our Auld Keep and pyrotechnics enhance a breath-taking Beat the Retreat. There are many fireworks companies offering displays at low prices but to guarantee a professional, spectacular show that will match our guest’s 5-star experience we only recommend 21cc Fireworks. Not only are they fantastic at what they do, they make the whole experience fun from start to finish!